A garden is meant to be a relaxing, rejuvenating place. You know, a spot where you can get back to nature, breathe freely and let your thoughts wander. But, with kids around, it's not always that easy to kick back. After all, you know what kids are like. They do whatever they can to find their way into anything - be it a thorny rose bush, the tools in your garden shed or the bird bath. And, when they're not doing that, they're thinking about wandering further afield. But, the good news is that, with a few simple steps, you can turn your garden into a safe place for kids. Here are some tips to get you started. It won't be long till you and your kid are enjoying yourselves, without having to stress about danger. First of all, you need to make sure that your kids can't escape. You know how kids' minds work. They see something interesting in the neighbour's yard and, the next thing you know, they're off - faster than a Melbourne Cup champion. So, the only way to get peace of mind is to make sure your fences are impenetrable. Patch up holes and check that all fences are high enough - all the way around. Keep an eye on this as your kid gets taller. Even if your kid can't scale the fence, there's a chance they'll have a go at letting themselves out. So add high-quality, reliable child-proof mechanisms to every single gate especially on the pool. Is your kid especially wily? Fortify the mechanisms with serious locks. That way, you'll know they definitely can't go anywhere. Whether you use herbicides, pesticides, bait or bleach, put all poisons in a place that your child cannot reach - even with a ladder. Your best bet is to lock them away in a secure, dry spot. Some people simply put poisons on high shelves, but why live with the worry of them falling down or being moved by someone else? And if they are out of date, pour them down the sewer. While you're at it, check your garden to ensure that no poisonous plants are growing. Common examples include poisonous mushrooms (which can sprout up quickly after rain), lily of the valley and peonies, but there are loads more. If you're unsure, seek advice from your local nursery. Sharp items pose so many risks. Toddlers might put them in their mouths. Little kids might try using them. Older kids might play fight with them. Regardless of your child's age, keep edges and points well away. As with the poisons, sharp objects or a jet pump with a water switch are best kept under lock and key. And remember to store them away every time you use them. Even laying an object down for a minute while you duck inside or make a call can be risky - it's too easy to forget. Thorny plants can be just as dangerous as sharp tools. Any kid who's run at full speed into a rose bush can tell you that. Thorns can rip into skin, causing pain and drawing blood. Either rip out thorny varieties or, if you want to keep them, cordon them off, so your kid doesn't injure him or herself. 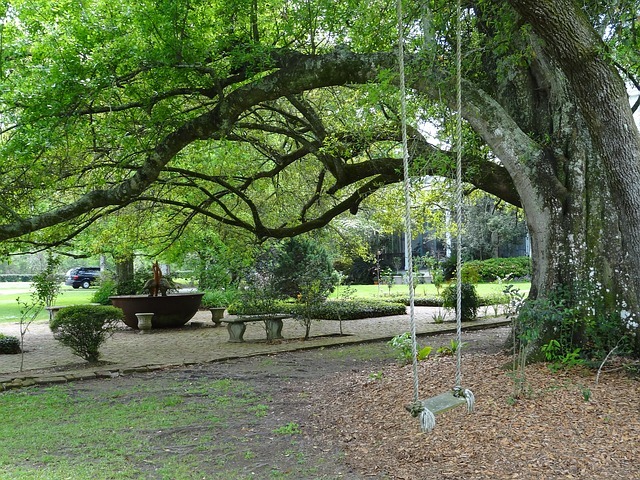 A surprising number of backyard injuries are caused by swings. Firstly, avoid erecting swings above hard surfaces - if kids fall off, they're more likely to suffer a nasty head injury. Secondly, don't place swings too close to footpaths. You don't want an unsuspecting passerby to be swung into unexpectedly. Concrete certainly has its advantages - it's much easier to look after than comparable materials. But, if your kid falls, there's not much give. So, wherever you can, cover concrete areas in softer, more fall-friendly materials. You can do this both permanently and temporarily. For example, you might consider buying some thin foam mats, which you can spread out during play time, but put away afterwards. Another option is to cover concrete with wood. Most of us remember to slip, slop and slap when we're heading to the beach or going on a long walk. But we forget that minutes in the garden can add up to hours. When your kid is playing outside, take the same precautions you would if you were heading out for the day. Ask them to wear a hat, dress them in long sleeves and cover them in suncream. Even with all that protection, it's better to stay undercover on scorching days, so it can be a good idea to build a shelter - even if it's just a shade cloth - so that outdoor play doesn't have to be too compromised by the sun. Even if you've taken every possible precaution, you should always keep an eye on your kid. You might think you've dealt with every hole, thorn or sharp tool, but surprises can pop up. If, by any chance, something does go wrong, the quicker you're on the scene, the less serious the consequences are likely to be. Don't let your kid hang out in the garden alone. It's hard to talk sense with a toddler. But it's never too early to start teaching kids about safety. As soon as they understand words like "hot", "sharp" and "danger", show them where they apply. Your kid might not get it immediately, but after a while, things will become clearer.